Of course deciding what to make from the canon that is Julia Child’s recipes – her legacy – was no easy matter. After a lot of indulgent eating this summer, I was craving something light and came across this lovely, simple recipe for Poached Salmon with Cucumber Sauce in her 1989 cookbook, The Way to Cook. I’ve poached chicken plenty of times but had never poached fish, and the tzatziki-like cucumber sauce totally called to me. Poaching is an easy and healthy technique, and one that I will employing with fish often from now on. It’s so easy! You can experiment with flavoring the poaching liquid (I poach chicken often in wine, broth, or citrus juice, for example), but this simple recipe calls just for water and wine vinegar. This dish is fast, easy, and healthy, and is equally as good for a quick weeknights supper as it is for entertaining. You can spoon the sauce over the top or pass it separately. I served it with her green beans (recipe to come Friday!) and a salad. Sheer perfection, and great for a hot summers night! This poached salmon with tzatziki-style cucumber sauce is a light and healthy supper perfect for summer. Measure 3 inches of water into a wide-rimmed saucepan. Add 1½ teaspoons salt and 3 tablespoons wine vinegar for every quart of water. Bring to a boil. Add the salmon. Bring to just below a simmer and cook for about 6 minutes until done. According to Julia Child "Fish is done when the flesh has turned from translucent to opaque and, rather than feeling squashy to the touch like raw fish, it feels lightly springy. It should still be juicy. Fish that is resistant and flaky is overdone - too bad!" Remove the salmon with a slotted spatula and transfer to a paper towel-lined plate to absorb the extra water. Transfer to a serving platter or plates and serve with the cucumber sauce. Put the cucumber in a bowl and toss with the salt, sugar, and vinegar. Let stand for about 5 minutes, then mix in the sour cream. Season to taste and fold in the dill. (May be made a few hours in advance and refrigerated). Check out these other great Julia Child recipes from the #SundaySupper crew! Love your photos! This salmon is a true winner and beautiful may I add! Nice job! Hi Katherine! I agree, there is nothing worst than dry fish! Yours looks so good! I love poaching fish…it makes me feel especially virtuous ;). I can just imagine what a lovely summer meal this made! That dill has me mesmerized! I can smell it if I close my eyes… Beautiful! Honestly I can never get enough salmon–this looks amazing! Yum! All of the fresh dill looks so good!! I love Salmon and this recipe looks amazing! Thank you so much for sharing during #sundaysupper. I love your posts and great inspiration. Lovely photos! Wow, so easy. I need to try poaching fish. And that cucumber sauce? I could eat it by the cupfuls! Thank you for sharing! 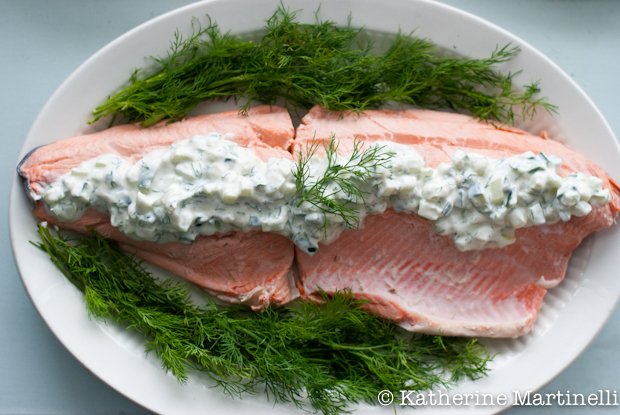 Love your presentation on the fresh dill, and the cucumber sauce sounds like the perfect topping! This looks amazing! Yet another reason to eat salmon. Yum! Katherine this looks super fabulous. I am loving your photos and recipe. Great SS recipe. My friend Jan and I attended the celebration for Julia’s 90th at Copia and will be celebrating her 100th this Saturday with boeuf bourguignon and chocolate cake. Your salmon looks so delicious we’ll have to do a little bit as a first course! Nice photos & food styling! I love this dish – it’s been ages since I’ve made it (at least 10 years). Such an excellent summer dish, and you did it proud. Thanks. I’m not a fan of salmon, but that cucumber sauce looks lovely! I bet it would taste wonderful on grilled chicken or even a different type of fish. Thanks for the inspiration! I’ve been trying to get myself to eat more fish and I must admit this looks so good! Love this post and the remembrance of Julia Child. The salmon looks delicious as well. Brilliant, like always! This looks wonderfully refreshing! Pinning this to make since it’s a great dinner for summer 🙂 I’m so glad you chose this one! Thanks for the memory [and, Bob Hope, just for once, I do not mean you!] – I cooked that dish time and time and time again that year until I felt I could do justice to it! What a wonderful remembrance message to a great lady who encouraged so many of us . . . thank you! I’ve never poached salmon before but it looks incredible, especially with the cucumber sauce on it. Beautiful recipe and photos, Katherine! What a lovely summer meal. Julia Child is a delight – another of her quotes that is a favorite of mine is, “If you’re afraid of butter, use cream.” She knew how to live! This is one of those simple, gorgeous recipes that are so emblematic of Julia’s style. Lovely! This salmon recipe is surely a winner! Your pictures are just amazing, K! You picked a lovely summery dish. Love all the dill on the plate, looks so fresh. YAY for JC’s 100th! Hi Katherine! Until I started reading blogs today I didn’t know this mouth would been JC’s 100th b-day. How wonderful for everyone to make JC’s recipes. I love this cucumber sauce. Definitely something new and I’d love to try. Your dill garnish looks beautiful! I’ve never poached salmon, my husband loves to grill and salmon’s the only meat we have, so a big wild salmon = grill time. I’m always up for another tip on when salmon’s done, so I’ll keep Julia’s words in mind. Seems to me, though, that the salmon is flakey when it’s done– that’s the sign we look for. But it’s not necessarily opaque all the way through. It should still be a little translucent in the very middle, that keeps cooking for a couple of minutes after you take it off the grill. For other fish, or for poaching, it may be different– I’ll have to try it and learn! by that unfortunate incident before the start. mit dorthin nehmen und ihm eine kleine Plastikschüssel und einen Löffel zum Spielen geben. For the sauce I used 1/2 English Cucumber, lemon juice instead of vinegar, and dried dill because I had no fresh dill in the winter – it was delicious and makes a great veggie dip as well! 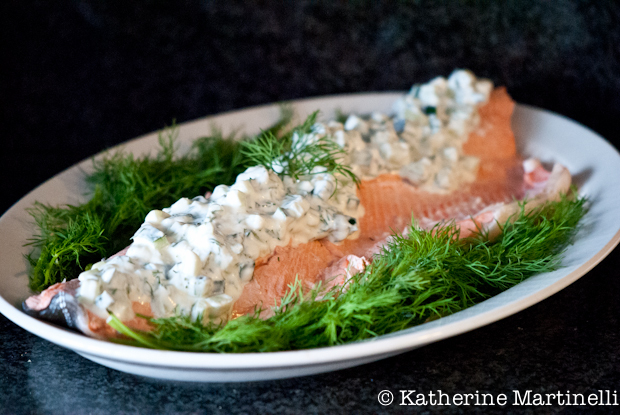 After a lot of indulgent eating this summer, I was craving something light and came across this lovely, simple recipe for Poached Salmon with Cucumber Sauce in her 1989 cookbook, The Way to Cook. I served it with her green beans (recipe to come Friday!) and a salad.